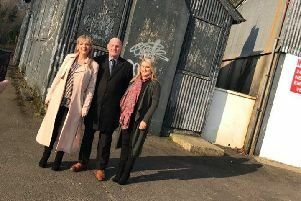 An area of Limavady plagued by graffiti has received a welcome makeover thanks to a community project involving local school pupils. The transformation of the spot, located at Rathbeg Extension, is opposite the 3G pitch and next to homes. The graffiti is gone and in its place is a huge, colourful mural which is down to the hard work of Year 11 pupils at St. Mary’s, who are undertaking a two-year Prince’s Trust qualification. The recently completed 24-foot long mural reflects aspects of the town, and parts of its history such as The Workhouse. Pre-planning began in January, with pupils even giving up free time to work on the mural, which was unveiled last week. St Mary’s teacher, Jackie Walsh, said the project received valuable input from the Roe Valley Residents’ Association. She said the qualification aims to develop personal development and employability, and is the equivalent of two grade-Bs in GCSE. Ms Walsh said the skills-based qualification allows students to give something back to the community as well as developing their skills. “When they first started they thought, ‘let’s get this done, what are we worried about?’, but they soon realised it was a lot of hard work,” said Ms Walsh. Ms. Walsh explained students chose the location as it’s a spot they walk past frequently to reach the school’s playing fields. “Having contacted RVRA, a talk involving the PSNI and youth leaders was organised. “It was lovely when a lady who lives next to the wall came out and said it would be lovely to see the mural on the wall rather than the graffiti. That was nice to hear. “The students were so keen to work on it and see it finished. “They hope it lasts, and I am very proud of the students and what they have achieved, and their attitude towards this. Karen Campbell from Roe Valley Residents’ Association praised the students. “Roe Valley Residents Association in partnership with St Mary’s High School recently completed a community wall mural,” said Ms Campbell. “Year 11 students as part of their Prince’s Trust qualification, had to undertake a community project which aimed to benefit the local community. “They identified the need, liaising with the local community, young people and other stakeholders. Ms Campbell said the new feature has provided a boost for the area. “This provides a much cleaner and brighter appearance to an area which has been used for graffitti in the past,” she added.